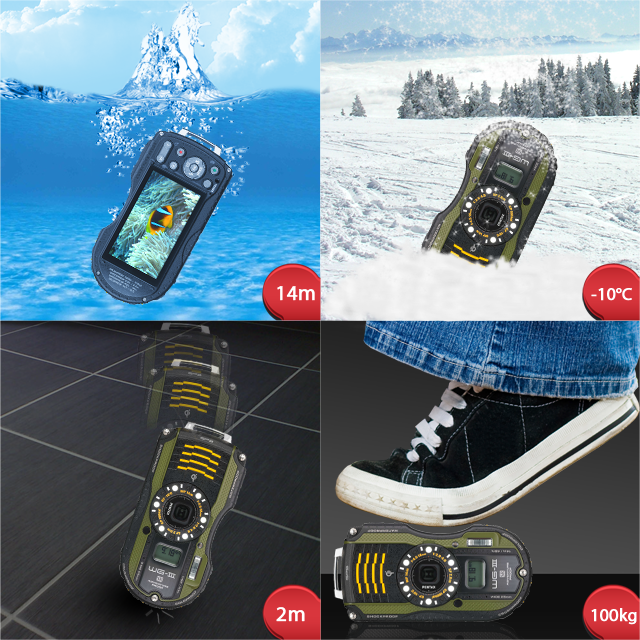 The Pentax Optio WG-3 is a waterproof, dustproof and shock-resistant compact camera which can be used at a depth of up to 14 meters and can withstand a drop of 2 meters, cold to -10°C and a weight up to 100kg. Features include a stabilized 16MP CMOS sensor, and a relatively fast F2.0-4.9 lens with 25-100mm equivalent zoom. This camera has versatile zoom lens accommodates a wide range of applications - from macro shooting of flowers to wide-angle shooting of spectacular landscapes. The Optio WG-3 also equipped with image-sensor-shift-type Shake Reduction, a 3 inch 16:9 ratio LCD monitor with 460K dots, and six built-in LED macro lights.With anti-shake feature, then you can maximize the zoom lens on this camera. The camera’s Intelligent Zoom function also extends the zoom range to approximately 28.8 times to cover the focal length of an approximately 720mm super-telephoto lens to capture extra-high-magnification images without compromising image quality. The Optio WG-3 is one of two version of this camera that is marketed by Pentax. The other is the WG-3 GPS. 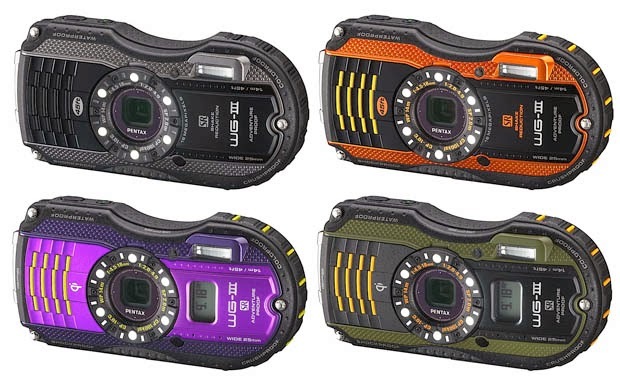 The WG-3 GPS is available in green or purple, while the WG-3 can be had in orange or black. Otherwise, the cameras are identical. Do you really need a GPS? If it is not really necessary, you can save money to buy a memory card or a tripod, so you can take pictures together with your family, without having to ask other tourists when you are on vacation. You can use this camera for underwater shooting when you diving in Bali, in Amed beach or Nusa Penida, then you can get pictures of the beautiful underwater life. The Pentax WG-3 is the less expensive version of the Optio WG-3 GPS, and while it omits the wireless charging and GPS (obviously) features of its costlier cousin it still offers a strong feature set for an affordable price. This camera delivers reliably good image quality and decent video, making it attractive as a 'knockabout' camera or a tough compact for travelling and everyday use. Like many everything-proof cameras these days, the WG-3 features a rubbery grip and rugged design. The Pentax Optio WG-3 has Sharp lens with Wide aperture and Short shutter lag plus Macro LED lighting and you can enjoy a very unique design. The WG-3 features a bold design that combines bright, metallic colors with a body style that's a bit wider than most compact cameras. The WG-3 is one of the more interestingly designed tough cameras on the market. Its lens is fast and sharp. The closest competitor of the Pentax Optio WG-3 is Olympus TG-2 and the Canon PowerShot D20. You can compare them before you decide to buy one of them. Due in February 2014 is still in the atmosphere of Chinese New Year, then you have a chance to get the special discounts, there is even a possibility to get additional accessories or a memory card in a larger capacity, for example, a 16GB memory card, so you can shoot more without dizziness due to runs out of memory.